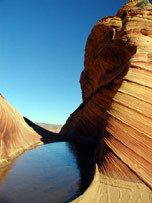 The Ultimate Southwest Vacation includes Coyote Buttes, The Wave, Paria Canyon and Vermillion Cliffs National Monument! Stay in Mt. Carmel Jct., the heart of the parks, and visit the treasures of the Southwest. Plan your Paria Canyon vacation with our Utah and Arizona maps. In these pages you will find insiders information on the best Coyote Buttes hikes. This detailed guide includes road maps, permits, park maps, pictures, trail beta, backpacking, history, fees, geology, flora, fauna, campgrounds. From Mount Carmel Junction, drive 17 miles to Kanab. Leave Kanab, drive 40 miles east on Highway 89. The turn-off is located on the south (right side coming from Kanab) side of the road. Its between mile markers 25 and 26, at a curve in the road, at the end of a guard rail. Turn at the unmarked dirt road. This is House Rock Road. I want to thank my best friend and hiking, canyoneering and climbing partner, Bo Beck, for all his help in creating this guide for Paria Canyon and the surrounding areas. It's 10 miles to the Stateline Campground from Highway 89. There are only 4 spots, so if you want to camp get a spot early. It's first come first use. Two of the camp sights are in Utah and two are in Arizona. There is no water, but there are vault toilets. Arizona Strip Field Office: 345 East Riverside Drive St. George 435.688.3200. Paria Contact Station: Located south of Highway 89 between mile post 21 and 22, between Kanab and Page, Az. 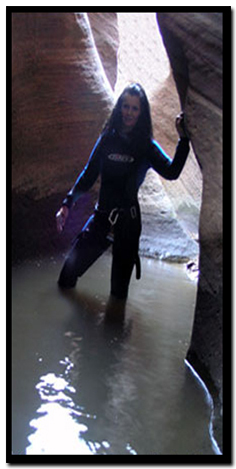 Suggested Gear: A sturdy pair of shoes are recommend to hike in Paria Canyon. Quality shoes will help grip the rocks and prevent injury. Experienced hikers like the Sportiva Exum Ridge. This shoe is great for hiking, bouldering and canyoneering. Beta: Coordinates, trail and canyoneering information by Zion Park search and rescue veteran team member, Bo Beck and www.zionnational-park.com author Tanya Milligan. Paria Canyon contains the spectacular Coyote Buttes Special Management Area. The notorious sandstone buttes sit at the bottom of Utah's Grand Staircase-Escalante National Monument and the upper section of Arizona's Paria Canyon -Vermillion Cliffs Wilderness. The Grand Staircase-Escalante is so close to Paria Canyon that many visit both places the same trip. In the end we will conserve only what we love; we will love only what we understand; and we will understand only what we have been taught.